Click the button below to register for the forum. One day, we (Selco and Daisy) were chatting online and decided that we wanted to start something new and totally different. The rules here are simple, if unusual for this world. We have sections for hot-button topics if people wish to discuss them, but aside from those areas, politics and religion are completely off-limits for the rest of the forum. We are here to learn and exchange information, not argue over partisan opinions and scripture. If you want to join us, you have to promise to leave those topics in the areas in which they belong. We welcome people of all beliefs, races, religions, nationalities, political orientations, and lifestyles. And by welcome, we mean that we won’t allow them to be insulted. Arguing about these things wastes time that could be spent learning about self-reliance skills and strategies. It drives people away who want to learn. Please be mindful of this and we know the experience here will be far more harmonious than the outside world. If you want to learn we’re here to teach you. Your privacy is important to us, so where’s what we want you to do. 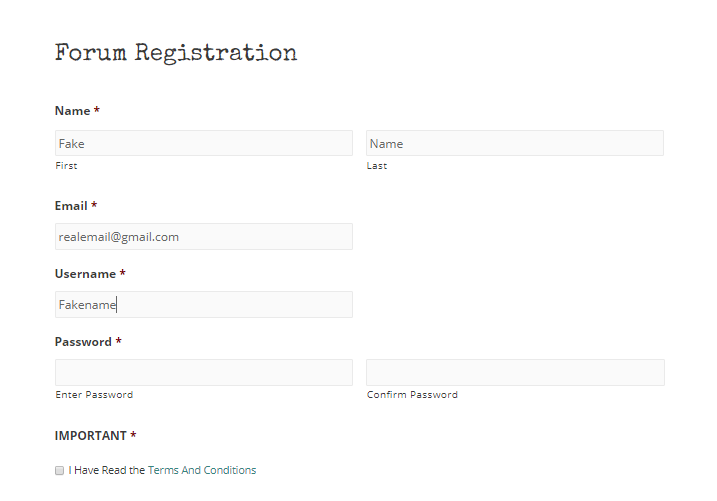 When you go over and sign up, DO NOT USE YOUR REAL NAME. We need a real email address so you can log in but don’t put your real name in there. Choose a username that is non-identifying. For the first and last name, use a version of your username. See below.